Thinking about taking up hiking? Here’s everything you need to know to get started. Hiking is a great way to get fit and to build up your fitness in wild and beautiful places. It’s a great hobby because you’re so busy admiring the views and stunning landscapes that you don’t even notice the hard work you’re doing. This article provides a comprehensive list of hiking tips for beginners which aim to take you from the couch to the mountains with helpful tips on how to build up your physical fitness and endurance, and also what to wear and bring with you. 1. How fit do I need to be for hiking? Start off slow. Build up your fitness on flat ground first. If you are starting from scratch, start working on your fitness on the flat ground around your neighbourhood, in your local park or along a beach. “If you’re starting off from the couch, maybe try a local 30-minute or 3km walk that’s flat first, take a rest on day two, and then try another 3km flat walk on day three,” advises John Kavanagh from the Dublin and Wicklow Mountain Rescue. Once you’ve built up some fitness, head for the hills. Start out on forest roads, using marked and well-maintained trails that have signage so you don’t get lost. It’s good to begin with fairly easy walks that have a good trail surface underfoot. Keep it short: Walk short distances and work up to longer walks as your body gets used to it. The Dublin Mountains Partnership also has a list of recreational trails online that you can choose from, with good descriptions and advice on the distances and altitudes that you will climb. If you’re interested in exploring walks and hikes along the Wild Atlantic Way, there’s a list of them online, with national parks, scenic spots and little nuggets of nature. 2. How much ground will I cover? Allow around one hour for every 4km when you are starting out. Don’t forget to give yourself extra time for rest breaks, lunch, taking photos and for going uphill. As your fitness improves, these times will get shorter. 3. Footwear: Should I hike in trail shoes or boots? ‘If your feet are happy, the rest of you is happy’. For hiking, your feet are very important as they’re in contact with the ground and are doing most of the work, so you need to get your choice of footwear right. Runners are fine for flat walks and easy forest trails. But it’s a different matter in the hills. You need to go to an outdoor shop and get fitted with boots. Some people wear trail shoes, but that’s down to personal choice. However, boots offer better ankle support, which might not prevent an injury, but they’ll definitely help. Break those boots in. Wear your boots indoors for a little while at first so you can still change them if they’re the wrong size. It can be wise to get a half or full size bigger for hiking than for a regular shoe. Make sure you get measured and take advice on what’s best for you. Socks are important too. Get good socks that are warm and comfortable. 4. What do I wear when hill walking and hiking? The right clothing is important. Jeans, for example, are not suitable for hiking because when wet, they get heavy and hold on to the moisture, keeping you cold and damp. Light and breathable. You’ll need some light, breathable, quick-dry fabrics, possibly with fine woolen base layers underneath if it’s very cold. Don’t be fooled at sea-level. Remember that even when it’s mild at sea-level, it can still be cold up high. You can lose around one degree in temperature for every 100m you climb, and the wind chill in the hills can make it feel even colder. That said, even when it’s cold in the hills, you’ll heat up as you walk, so best to wear plenty of layers so you can adjust as you go. Lots of thin layers are better than one thick layer so you can add and remove them easily. Always be prepared. Never leave home without a waterproof jacket and trousers. Also, bring spare warm clothes and at least one extra layer in your bag, so you can put it on if you’re sitting for a while. A survival blanket is also very handy and light to carry. If you’re hiking during the colder months, bring a hat and gloves, even if it doesn’t feel cold at home. Put on an extra layer when you stop for a break and try to stay out of the wind. If you or someone in your group is cold, the best remedy is to eat something sugary and get moving. Warm drinks are helpful, but to stay warm you must stay active. 5. What else do I need to bring hiking? Food and water. Energy-rich food like dried fruit, nuts and chocolate are great in the hills because you’ll burn a lot of calories and you don’t want to run out of fuel. You’ll also need plenty of water as you never know when you’ll end up spending longer out on the trail than you intended. A small first aid kit is also a very good idea. (Learn how to use everything in it!) From autumn onwards, it’s also recommended to carry a head torch just in case you get caught out as it gets dark. In fact, we recommend always keeping a small emergency head torch in your pack – just in case. 6. Do I need a map? Will a smartphone do? Don’t depend on your smartphone. It can have handy apps in addition to your map and compass, but if it runs out of battery or falls in the river, you’ll be down all of your navigation equipment. 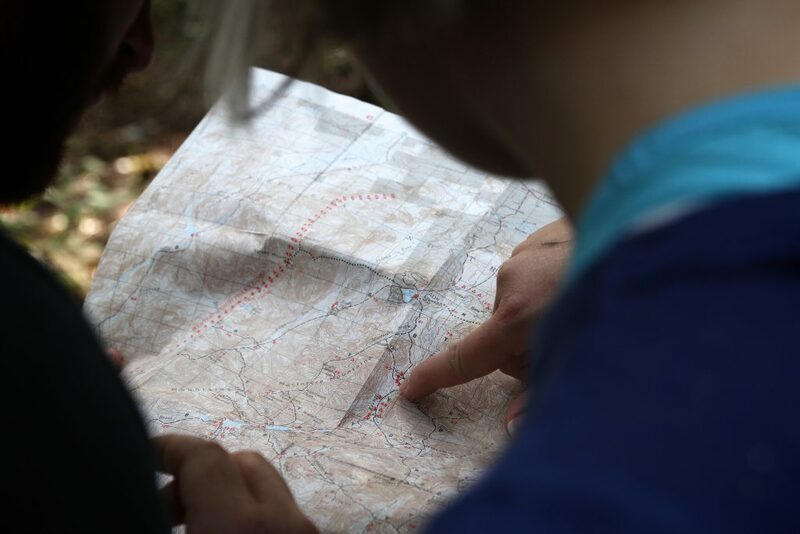 A map is essential – and not a road map! And you’ll need a compass and will need to know how to use it. 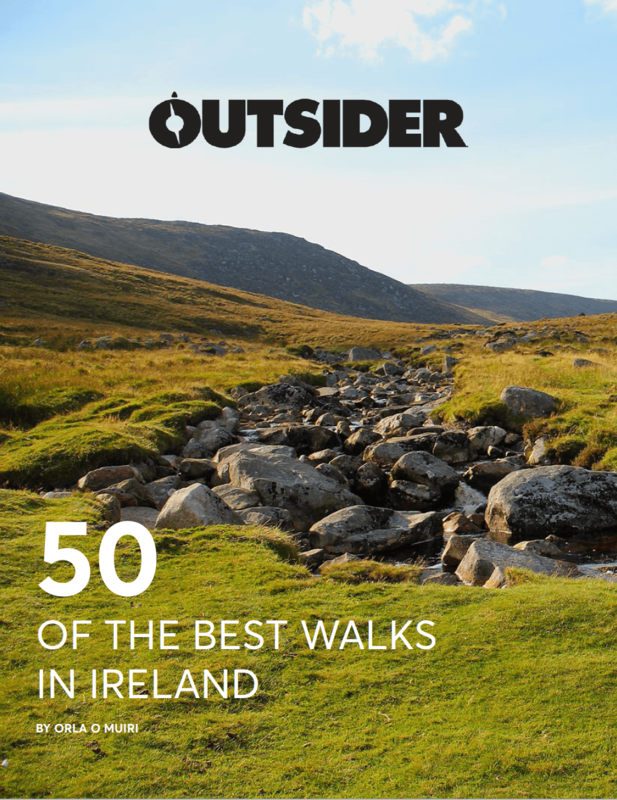 You should always carry a paper map like those produced by Ordnance Survey Ireland that will show you routes like The Wicklow Way, for example, and topographical features like mountain peaks, rivers and lakes. Mountaineering Ireland has some handy advice around navigation on its website, or you can take a course in mountain skills with private companies like Extreme Ireland or through a training run by Mountaineering Ireland. 7. Do I need walking poles for hiking? Walking poles can be nice to have – especially if you have dickey knees – but are a personal preference. Some people swear by them and won’t go hiking without them, but others don’t use them at all. If you carry it in, you carry it out. 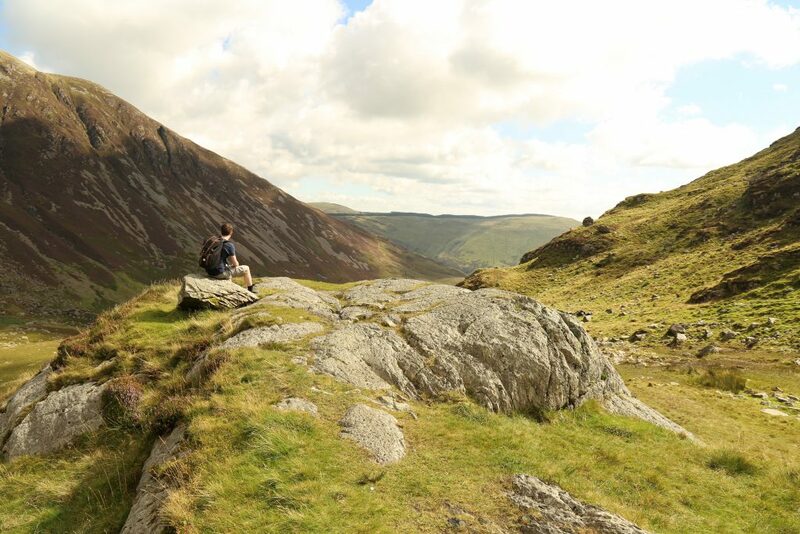 Hill walkers should abide by the ‘Leave no trace’ ethic when out adventuring. Dispose of your waste properly by taking home all litter, food and even fruit peels and other biodegradable foods. Also, bring home toilet paper and even tea bags. Going to the toilet outdoors, learn the rules. For number ones, make sure you’re well away from streams. And if you’re caught out and must do a number two, you should dig a small hole at least 15-20cm deep at least 30m from water or the trail, and cover it when you’re finished. Leave what you find behind. Leave gates as you find them, whether open or closed, and also leave plants, rocks, flowers and even fallen trees as you found them. Check the weather forecast so you know if it’s a good day to head up into the hills, as high winds and cold temperatures will be far more extreme the higher you are. Don’t forget to check dusk times so you know when it’s going to get dark. It’s advised to finish your hike well in advance of dusk. Join your local walking club. Hill walking is a great social activity and is a lovely way to meet new people. The other advantage of joining a group is so that you can get some guidance and benefit from the group’s experience — and they’ll likely have loads of ideas of beautiful hikes in your area. The Get Ireland Walking website is a good source of walking groups throughout the country. 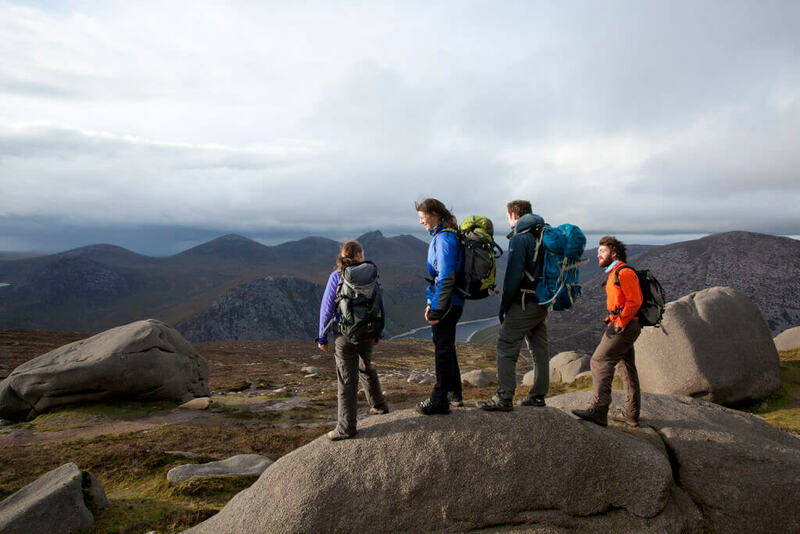 We regularly list hiking festivals in our events section and Mountaineering Ireland also has a list of events on its website so you can see what’s on. In the case of emergency and if you need assistance, call 999 or 112 and ask for mountain rescue. Emergency calls (999/112) use any network available to your phone, not just the one you’re on, so you should be able to make an emergency call if your phone has no coverage. Great share! Hiking is a great adventurous activity is makes you exciting feelings, you get a chance to explore adventurous places through hiking, but along with its fun experience, one should also be careful as it is quite risky for that one have some nice tips or guides. North Yorkshire 3 Peaks also offers such hiking challenges with the best guidance. Check NY3P for your next adventure trip.